Each of us has a destiny, a plan and a purpose God always intended us to fulfil. In preparing for that destiny, we have a choice, whether we want to go through this process and allow God to change us. Today I want to look a little more at our soul gates. Our conscience gets dulled because of sin and rebellion, and therefore if we have operating in our lives any weaknesses, patterns of sin, ‘normal, acceptable behaviours’ which are neither normal nor acceptable to God, we have to be willing to own them. We cannot argue with God in this process. If we do, we will lose the argument and it will be much harder to be transformed. I have learnt to confess it, own it, repent of it and renounce it. Repentance has nothing to do with feeling sorry, or with doing penance! The Greek word metanoia really means ‘having the same mind as God’, so to repent is to change your mind and think about something the way God thinks about it. If God shows me something, He is always right about it: I am not going to deny it. He knows what is there. I do have sin areas, weak areas in my life. And God showed me patterns of sin when I went through this process that I had to own and say ‘yes, I have acted like that’. And I did not realise it, until God showed me, until I opened up my heart and asked God to show me what goes on inside me. In doing that, I was able to repent, renounce, and my conscience became really sharp. I applied the blood of Jesus to it. I received forgiveness and cleansing. I refused to feel guilt, shame and condemnation (which are things the enemy brings). Every one of us needs to know that we are righteous. That is part of ‘having the same mind as God’ – He has made me righteous, and He calls me righteous! Then reverence can flow through that conscience gate and guide me and direct me in everything I do every day. But if that conscience gate is damaged, or blocked, affected by sin, it will lead me astray. I need to have it transformed. Rationalism, scepticism, cynicism, denial, projection: our mind will fool us into putting the blame on somebody else, and not dealing with what is on the inside of us. We might have words, ideas, philosophies and doctrines in us that need changing, familiar spirits or religious spirits operating in us, behaviour cycles that we recognise. Just own it. Do not argue, give up. Surrender. Stop fighting for the flesh, and surrender to the spirit. As we do, we apply the truth of the word which God speaks to us. The mind of Christ will start flowing through us: the thoughts of God flowing through us; revelation and faith flowing through us. Every one of us has seen a great many negative images in our lifetime. We have to deal with them. Otherwise the enemy will bring them back and use them to pollute our imagination. We want to be able to see revelation, images, and visitations, both in the heavenly realms and in this one; we will not be able to do so if our imagination is polluted. TV, films, games, magazines, books, fantasies – even life itself: we are going to need to get rid of whatever we have seen that is negative. Again, I owned everything I saw as sin. I repented and renounced it and I painted it out with the blood of Jesus. I now no longer have any of those images in my memory. They are completely gone. It is like having a filing cabinet in my mind that has folders in it. Each one has an index tab with something written on it; but when you look inside the folder, there is nothing in it. I can remember the things that have happened in my life but I can no longer remember the details of them or recall the images of them because they have gone. They have been cleansed: all those images are completely wiped out of my memory. So if you have images that you are plagued with, put them under the blood of Jesus and paint them out so that they are no longer there. We can have a purified memory and a cleansed screen, so that we are able to see visions and have dreams, and experience revelation from God flowing. We will have the eyes of our heart opened and enlightened: a flow of hope, and a flow of revelation: visions, dreams, visitations in the heavenly realms, all because our imagination is now clean. We can be cleansed. But we need to actually allow God to do it. It is the same thing with our subconscious mind. All the memories, words, vows, curses: every trigger that I experienced in my life, every defence mechanism, every coping mechanism. I owned it, repented of it (changed my mind about it) and renounced it. As we apply the blood of Jesus, that soil of our heart will be dealt with. The hardness will be dealt with; the stones, and the weeds. We will just get a flow of revelation knowledge from God; it will flow through our subconscious and trigger the right things, and we will be moved by the things that move God. Our emotions are affected by all the trauma, all the hurts, all the betrayal, all the abuse: disappointment, pain, and rejection we have felt and experienced. And we have to admit we have hurt other people as well as being hurt by them. If you are feeling anger or withdrawal or depression, all those things arise from emotions that we have not dealt with. We either turn in or we turn out. We need to own all those mechanisms: we need to repent, forgive and release all the hurt, repent of everything we have done to hurt others, and renounce it all. Then we are going to start to get a flow of God’s heart, of intuition, of being moved by what moves God. If you are stubborn and if you have been rebellious, willful, or controlling you have to own it. Fear, doubt, unbelief, indecision: if they are operating in your life, own it, repent and renounce it, and in that process apply the truth of the blood of Jesus, and God will begin to work things in you, positive things: patience, boldness, courage, perseverance. You will begin to get into a flow of worship, a flow of obedience, in which we are outworking the truth of God’s word day by day. I know this is a lot to take on board all at once. 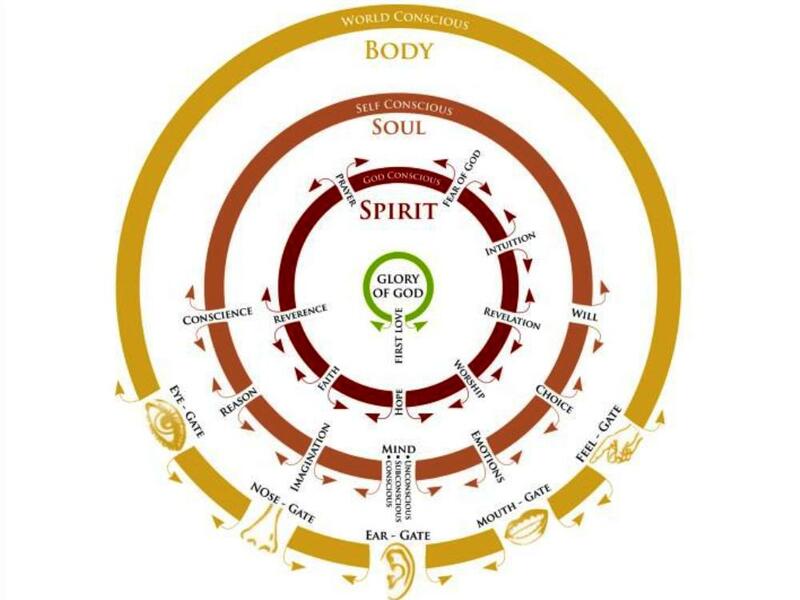 I am putting it all out there and I am just encouraging you to use the gateways diagram (or spinner) to begin to deal with whatever of this is in your life. Ask Jesus to come and stand in the gateways with you, and show you what he sees. It may not be a quick process, but with a bit of application you can do it. Own it, repent of it, renounce it. All it takes is surrender, and allowing God to deal with it. We were delighted to host internationally renowned speaker Kari Browning, teaching on this topic for the first time in the UK. The technique Kari uses to release toxic emotions involves prayer, the laying on of hands, and the use of therapeutic-grade essential oils. Now those who belong to Christ Jesus have crucified the flesh with its passions and desires. If we live by the Spirit, let us also walk by the Spirit (Galatians 5:24-25). Sin, and all the ‘sins’ we commit, are an indicator of our need for God. The original ‘sin’ came about through losing sight of our true identity (that is what Adam and Eve did in the garden); individual ‘sins’ are things we do to make us feel better about ourselves because we fail to see ourselves as He sees us. Those who struggle with lust, it is because they desperately desire intimacy: God is the best there is if we are looking for intimacy and love. I have been crucified with Christ; and it is no longer I who live, but Christ lives in me; and the life which I now live in the flesh I live by faith in the Son of God, who loved me and gave Himself up for me (Galatians 2:20-21). Am I willing to love God in return, and give myself up for Him? For Him to change me, transform me and conform me to His image, so that I become more and more like Jesus here on the earth? I did this as a crash course and worked through every year of my life, to deal with every blockage in every area of my soul, and I did it in three weeks. Now, I had three weeks I could set aside to do this, and I know not everyone can do that, but I am encouraging you to make a choice today to start working through the things that have accumulated in your life and to allow God to change you. The First Love gate is the key. All of us have emotional damage through relationships, spouse, parents, family, friends, or authority figures. That damage causes us to lack trust, and to put barriers up to protect ourselves. When we want to let God in, those barriers get in the way. We are often afraid to ‘let go and let God’ come and be in control. We have to deal with those things. Unmet needs will affect my soul’s desires and motives. Unhealed hurt will affect my emotional desires and motives. Unresolved issues in our lives will affect our trust. We have to surrender and allow God to do what only He can do. And if we have problems, we need to work through them: forgive people who have let us down and disappointed us, repent of and renounce the things we have done to meet our own needs and protect ourselves. All of us need acceptance, love, affection, value and worth; approval, significance, affirmation, identity and purpose; security and safety. They are all needs that God has built into us: they are all needs that He wants to meet in us Himself. He does not want us to try to meet those needs through the flesh, but all of us have tried exactly that. As a result, all of us have been damaged, and all of us need to be transformed and find God’s love. I worked through these areas: my conscience, my imagination, reason, subconscious mind, emotions, choice and will. I worked through each one, to deal with the things that were blockages and stopping God flowing through me and working through my life. Is that really complicated and difficult? No, it is a choice. Do I really want God’s presence and His power? Do I really want to be manifesting the kingdom of heaven on earth? Or am I content to carry on living the way I have always lived? God will do it: the choice is mine. 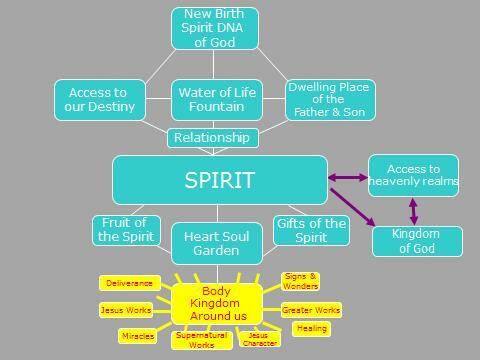 We have looked at the gates of our spirit, through which we want God to flow from the inside out. Now we are turning to our soul gates. Our soul gates are: conscience, reason, imagination, mind, emotions, choice and will. Our conscience is the ears of our heart. It is our protector and our director, our guard, and our guide. Our conscience will keep us from wrong and direct us to good. Sadly, our conscience can be dulled or seared by repeated exposure to sin (Titus 1:15). We need our conscience cleansed, clear and sharp. It is not that we reason and try to work it out with intellect: this is about being able to translate and interpret what God says to us, whether in scripture or other ways God uses to communicate with us. The eyes of our heart. It is absolutely key that we develop our imagination. Our western culture and education system have trained us out of using (and valuing) our imagination. Our imagination was given to us by God so that we could see what He is doing. So that we could see visions, see dreams, see the heavenly realms, on the screen of our imagination. We need to learn how to use it again and train it so that it grows and develops. Our mind, conscious and subconscious, is where the storage programs are. Here we find our memories, the things God has said to us, and belief systems. It is like the hard drive of a computer. Everything is stored there. The subconscious mind, our heart, sits somewhere between our spirit and our conscious mind. Memories, beliefs, values, lies, truths, mindsets. Jesus called this ‘soil’ and it can have all kinds of seeds sown into it. Our subconscious mind is affected by our DNA nature, from our parents, that sets up defence mechanisms and coping mechanisms. Our patterns of behaviour come from what we believe. Nurture has an effect too: we have had a whole lot of experiences of life during our upbringing and education which train us to operate in certain ways. Trauma too, the things that happen to us and cause us to make vows and decisions based on our experience. All those things also get connected with familiar spirits assigned to our life. They know us, and they lie to us, in order to get us to operate from a false belief system. All those things on the inside of us manifest on the outside in the way we think. So things like our reactions, our attitudes, our responses, fear, worry: all come from the inside and manifest in our mind. When revelation comes, from scripture, from heavenly or earthly experiences, from the Holy Spirit, things can start to change. Then we have an opportunity of surrendering to Him, and He can deal with familiar spirits who lie to us. Our behaviour patterns start to come from the revelation of the truthof what God says (or from Jesus, who is Himself the Truth), especially about who we are. Our mindsets are based on the truth of who God says we are. Our attitudes, suggestions, the ideas that flow from our spirit into our minds are flowing from the inside out. But if we do not deal with all those things on the inside we will continually have triggers which set us off thinking in a particular way, and that is where the conflict takes place. We have to be willing to allow God to transform us from the inside out. Our soul has emotions, where our responses and our feelings are, where we are moved, where we get those gut feelings. Emotions affect our esteem, our worth, whether we feel love, security, acceptance and value. We have all had unmet needs. Maybe as a child, or in relationships, we did not receive all we should have received in the way of love, security, acceptance, encouragement and so on. Then we end up with low self-esteem, or disappointment in our life. Those can result in our feeling insecure, rejected, being dependent on other people, or in co-dependent relationships. We try to get our needs met in these ways because we have not been in right relationship with God, and He is the only one who can properly meet those needs. We have looked to the world, and been hurt. We experience guilt and shame, and carry lots of unhealed hurts where people have let us down, and caused pain in our life. Since we have not learned to forgive and release them, this has set up anger, resentment, and bitterness, which are all emotional things. Now those emotions can completely rule our lives – if we let them. We have to deal with them. They affect what goes on in our conscious mind and then they trigger responses all the time. Our behaviour does not just happen. Our behaviour derives from the things which are on the inside of us and God wants us to operate in forgiveness, and to be restored, changed and renewed so that the strongholds and all the hurt and pain in there get dealt with. We also have a will. If we sin, through stubbornness or rebellion, our will is damaged and effectively becomes a barrier to what God wants to do. That sets up such things as unbelief, indecision, control, doubt and fear. As we deal with them, God wants to replace them with humility, confidence, boldness, courage, persistence, determination, perseverance, self-control (which is a fruit of the Spirit). All those things can happen if we allow God from the inside out to transform our life. It is really important for us to understand what is going on inside us and how we operate. Some of us have been taught to peel back the layers to expose what is going on deeper down; that is OK as long as we don’t try to change ourselves from the outside in, because if we approach it from that direction it is a battle we will ultimately lose. If we focus on the problem, the problem gets bigger. If we focus on the solution, the problem gets smaller. In Jesus, nothing is impossible. Nothing will prevent God from doing what He needs to do, if we surrender to Him. The final gate is choice. In the end, it all comes down to one question. Once we have cleared out everything which would lead us away from surrendering to God and allowing our spirit to rule, we still have to make a conscious, daily choice. What will we choose to do? Let us press in, and get to the place where all these gates are flowing with the life of God and transformed. At the moment most of them are not like that. We cannot change ourselves. We have to invite God to come into those gates and transform us. It would be really dangerous if the glory of God started manifesting through us, through an unholy life; dangerous both for us and for the people around us. He will not allow His presence to be manifested out of us until there is a holy life for it to flow through. But He does want to manifest His presence through us. We have seen that God is on the inside of us, and that we want to allow Him to flood our whole being with glory so that we overflow to transform the world around us. One of the things we have found really useful here in Freedom Church is to make a rotating cardboard cutout of the ‘gateways’ diagram shared with us by Ian Clayton. Then we can line up different combinations of gates and ask Jesus to stand with us in them and show us how the river of life should flow through that particular combination. 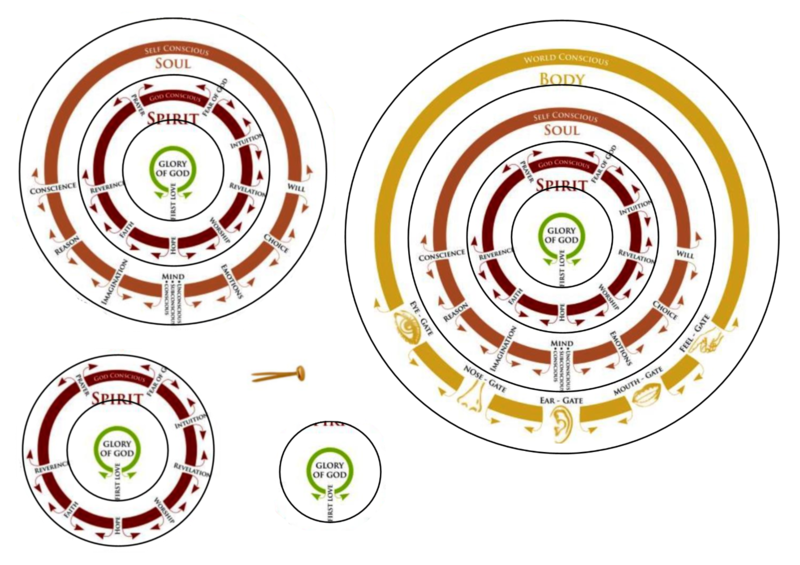 To make one, you need to print off four copies of the gateways diagram – or click here for one with the cutting circles already drawn on – onto thin card (you can print it on paper and stick it to card if that is simpler). Then cut them out as in the diagram below, so that you have four different sized circles. Make a small hole in the centre of all four circles. Finally, fasten them together in order, face up, with the smallest on top and the largest on the bottom, using a split-pin type paperclip pushed through from the top. You might want to put some sticky tape over the ends of the splayed pin because they can be quite sharp. There is an image of the completed spinner in the header image of this post (and below). You will see that the first love, hope, mind, and ear gates are aligned from the centre. Spin each wheel separately to line up any combination of gates as a visual prompt as you work through them. 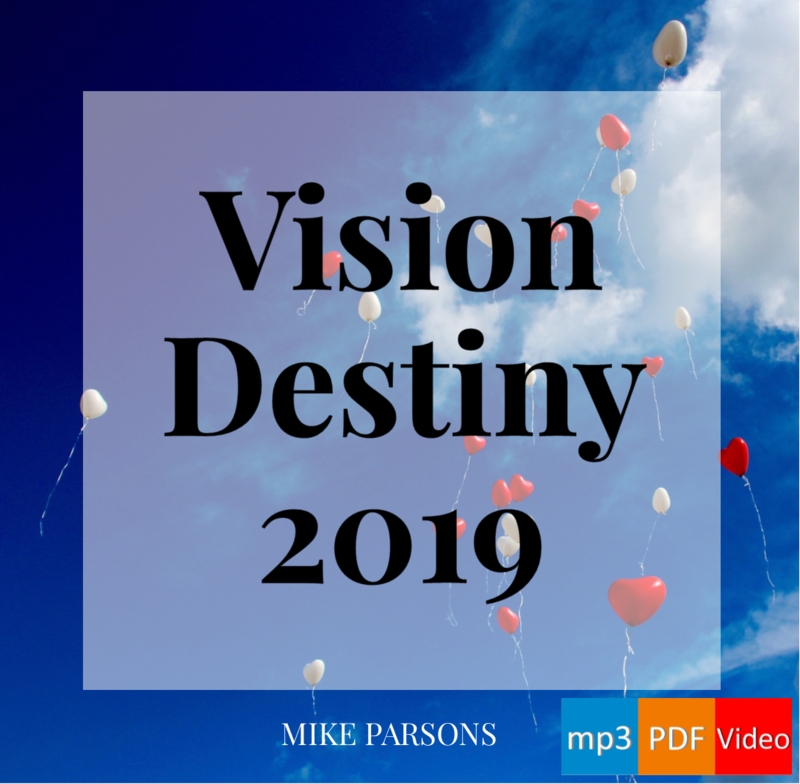 Everything we are writing about in this series on Preparing For Destiny comes down to (or builds up to) one thing: what will we choose to do? Will we choose to do what Jesus would do? Or will we choose to do what our own flesh tells us to do? If we are to choose right, we need to be flowing in the Holy Spirit. We need a connection with the Holy Spirit. We need to be baptised in the Holy Spirit. We need to be speaking in tongues. Praying in tongues is a major flow of the life of God which is within us. It builds up an environment around us which draws the presence of God, so that God comes and fills that space. Believing itself separated from God, our soul had no alternative but to try to get its needs met however it could. So it tried to meet those needs by drawing on the world. We all have a built-in need for love, acceptance, security, significance and purpose. But the world cannot fully meet those needs (it was never intended to) and as a result, our soul is damaged and we experience hurt, pain, rejection, insecurity, fear, disappointment, guilt, and shame. Then we hear and respond to the gospel. Our spirit now comes alive to God, and suddenly we realise it is possible for us to have our needs met by Him. But we are used to getting them met by the world. So we have to transfer our source of acceptance and love; we need to transfer it from the world around us, to God, who is on the inside of us. We start to look inwards, to God in us; not outwards, to the world. As we do that, as we are transformed, as we are restored in our soul, then God deals with that damage. We do not need to look to the world to meet our needs. We look to Him. And we can then start to manifest through our body the life that flows from the spirit. You have seen Christians who positively glow with the life of God within them. More than that, we can be literally transfigured. 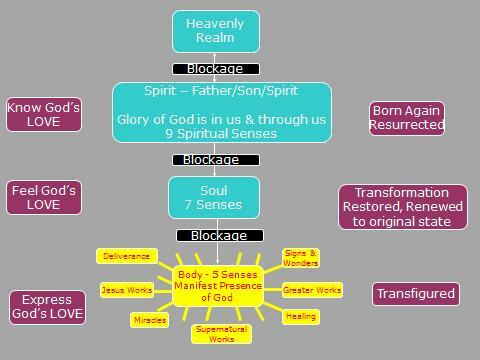 Here is another way of looking at this: we are born again, in our spirit we have the Father, Son and Holy Spirit, the glory of God in us, and we have nine spiritual senses that begin to develop through practice (we will look more at those another time). We know God’s love, we have access to the heavenly realms, and can enjoy real intimacy with Him, which enables that love to be outworked in our lives. 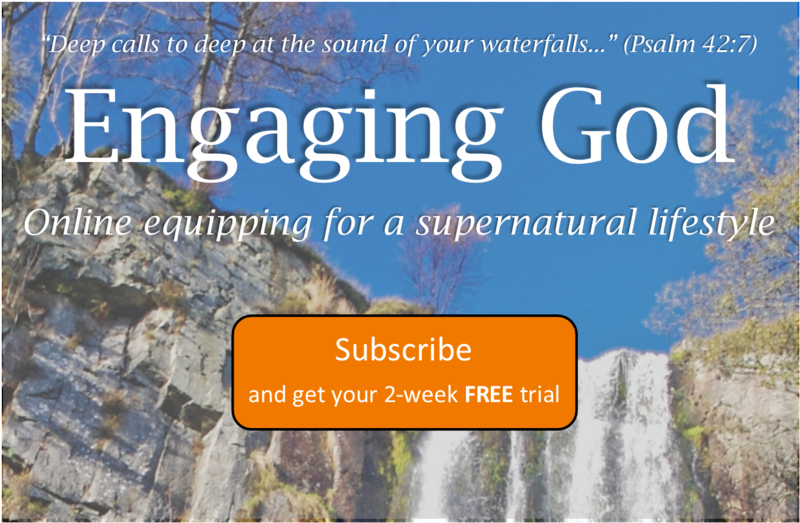 Then our soul senses develop too, and eventually we start to manifest around us the glory of God: deliverance, the works of Jesus, miracles, supernatural works, healing, greater works (John 14:12), signs and wonders: all start to flow out through our lives. Or that is what should happen. But there are blockages. There is a blockage between our spirit and the heavenly realms, because probably no-one ever taught us we could go there (in fact mostly they taught us that we could not, at least until we die). There is a blockage between our soul and our spirit, because our soul is used to being in control. There is a blockage between our soul and our body, preventing the flow of life streaming out from us to the world. 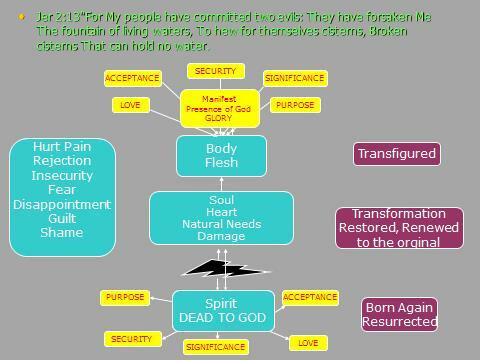 But as we are transformed, these blockages are removed. Our spirit and soul start to work together. We begin to feel God’s love, as well as to just know God’s love for us. We learn to access the heavenly realms, so we can express God’s love and manifest God’s kingdom in and through our lives to the world around us. We are changed, transformed, transfigured. And this last diagram sums it all up. With the new birth, the DNA of God is in our spirit: we have access to the fountain of life; we have access to our destiny; we are a dwelling-place of God, through relationship. Our spirit now needs to produce the fruit and the gifts. The river of life flows through the garden of our soul, so that our whole life is manifesting God’s glory. We have access to the kingdom of God within us, and the kingdom of God in the heavenly realms, and as we learn to operate there our life is transformed. As we have said before, the key to this is practice. You have to practise to train your senses. You have to practise how you transform your soul. We have to train our spiritual senses; we have to train our soul senses, to be connected up with the kingdom of God in heaven to outwork on earth. So we are going to do that, over the coming weeks on this blog. We are going to help you train your spirit senses, train your soul senses, and we are going to see transformation taking place. You have been invested with authority, but you have to come into that place of succession so that you can be enthroned. To bring God’s kingdom from heaven to earth, you have to dethrone the soul. Now that is not an easy process, but you can do it. With God and our spirit working together, we can all do it.